City officials offered a deal to the hunger strikers at Dyett High School, but that only strengthened their resolve. It was an opportunity for the hunger strikers and their supporters to reflect on the centuries-old African American struggle for freedom and their role in the struggle–Day 23 of the hunger strike to create the Walter Dyett High School for Global Leadership and Green Technology at the now-closed Dyett High School building in Chicago’s Washington Park. The hunger strike is now at Day 28 as of this writing, and the Chicago Board of Education has finally opened talks with the strikers. 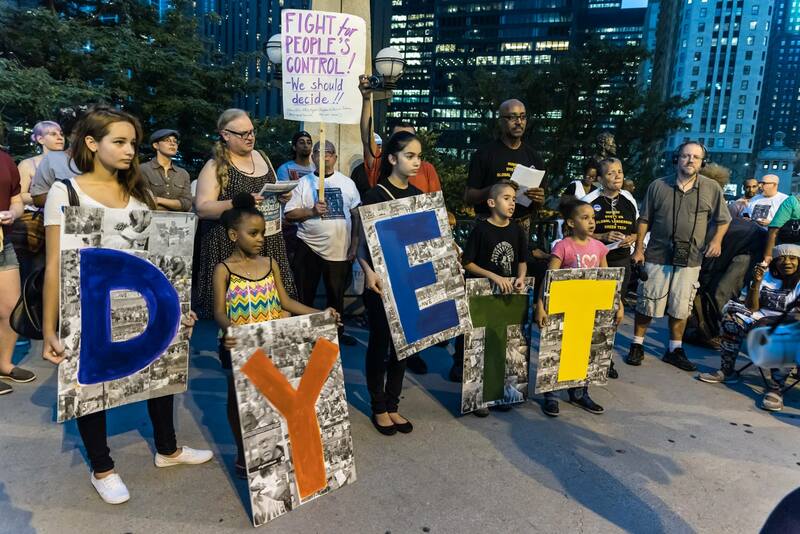 There is a cautious optimism that perhaps the Dyett struggle, which in one form or another has been going on for at least six years, will reach a milestone in its journey toward education justice. WHEN DYETT was closed earlier in 2015, there were no more open enrollment neighborhood high schools left in the South Side Bronzeville neighborhood it once served. The hunger strikers have been willing to put their lives on the line for quality education, an African American tradition that goes back to slavery times. 2. Global leadership/world studies curriculum. 4. Fully elected local school council in year one. 5. Coalition to Revitalize Dyett represented on design/planning team with six members in prominent positions. Those who paid protesters to support closing Dyett cannot be on planning team. 6. The school must retain the name Walter H. Dyett. 7. Vertical curricular alignment with the six feeder schools identified in the Coalition proposal. 8. Community school (open till 8 p.m. daily, with programs and resources for parents, students and the community). These demands grew out of the struggle to save Dyett High School and the detailed proposal the Coalition wrote to meet the educational needs of an African American community living in what Mayor Rahm Emanuel likes to tout as a global city. The proposal envisions a rich full curriculum of the humanities, the arts, math, music, world languages, science and physical education as well as green technology and the development of leadership skills. The governance of the school would be based upon a participatory model that includes parents, teachers, students and staff. There would be close collaboration with the community at large. As Coalition member Pauline Lipman said at a speak-out supporting the hunger strikers, the proposal could serve as a model for working class education throughout the city. YEARS BEFORE being closed at the end of the 2014-15 school year, Dyett had been a highly regarded neighborhood middle school where parents from around the city also sent their children. Dyett is located in Bronzeville, a historically African American neighborhood that has become contested terrain because of its location between the glittering towers of downtown Chicago and affluent Hyde Park where the University of Chicago is located. Gentrification efforts were stepped up in Bronzeville in the late 1990s and resulted in a wave of Bronzeville elementary school closings. Bronzeville became a living laboratory for the city elite on how to do school closings, resulting in the infamous 50 school closings of 2013. Most of those affected have been Black and Brown students. According to Jitu Brown, the problems for Dyett began in 1999 when, against the wishes of its local school council, it was changed to a high school, but without the necessary resources. Dyett was to be starved into destruction. In 2011, CPS announced that Dyett would phased out. The last handful of students were reduced to taking courses like art and PE online. The practice of starving neighborhood schools in Black and Brown working class neighborhoods, labeling them “failing” and then opening up charter, contract and turnaround schools to replace them is part of an overall privatization drive closely linked to a general disinvestment in local businesses and social services necessary for strong and positive social relations. School closings are designed to destabilize working-class communities. Neighborhood schools are part of a complex set of intergenerational human relationships that help hold communities together that are under siege from outside forces. As people leave the neighborhood in desperation, this opens the way for profitable city-subsidized redevelopment schemes that push out remaining working-class residents (mostly people of color) in favor of mostly white affluent newcomers. Children naturally want to love. But this society has inflicted so much hate on Black and Brown communities that the violence you see stems from that. It’s manufactured…Dyett was our school. It had been there for 30 years. There was so much love and memories there. They didn’t just close a school, they closed the doors on the future of our children. They killed so much memory. They can never pay us back for what they have done to our children. After CPS’s plan to close Dyett was announced four years ago , a coalition of community members led by KOCO created a proposal for it to reopen as what they have called a “global village academy,” an open-enrollment neighborhood high school where teachers, parents and local school council members would work together with educators from the local elementary schools to share resources to create a continuous educational pipeline for students from preschool to 12th grade. The district ignored the idea. BUT FACING more protest, the Board of Education finally agreed to solicit ideas for how to save Dyett, the last open enrollment neighborhood high school in Bronzeville. The Coalition to Save Dyett, in close consultation with parents and community members, wrote an ambitious proposal for a global-leadership/green-technology high school with partners that included the Chicago Botanic Garden, University of Illinois and Chicago Teachers Union. There were proposals from two other groups, neither of which were very inspiring. The Board promised an answer in August 2015. When it postponed its decision until September, after the start of the school year, the Coalition concluded the fix was in. Drastic action was needed. The hunger strike began with the strikers sitting outside of the Dyett building in a small circle of folding chairs, meeting the media, consulting with their supporters and organizing actions like the nonviolent disruption of a mayoral town hall budget meeting which saw Mayor Emanuel flee out the back door. The strikers have received help from a variety of organizations, including the Chicago Teachers Union. This was not what the community had been fighting for. The strike continued. The strikers went on with their protests, rallies and news conferences. Some of the hunger strikers flew to Washington, D.C., to meet with Education Secretary Arne Duncan. They are thinking about taking their case to the United Nations after Chileans who battled school closings in their country told them of the success they had when the UN became involved. The battle had gone international. Then, on September 11, the hunger strikers got a call from the Chicago Board of Education saying it was finally ready to talk. The results of the meeting were inconclusive, but the hunger strikers expressed cautious optimism to their supporters at a meeting held that evening at Operation PUSH. BUT WHAT is it about the Dyett High School proposal that is so abhorrent to the mayor and the city elite? This vision of education runs completely counter to the corporate-driven model favored by the mayor with its rigid top-down curricula; its brutal regimen of high stakes testing; its racist allocation of resources; its sneering contempt for Black and Brown people; and its privatization of public education. The mayor’s vision rips communities apart and divides them. It is designed to blunt the intellect and shrink the imaginations of Black and Brown working-class youth so they will submit to the demands of austerity capitalism. ONE AFTERNOON before we marched to President Obama’s home for the candlelight vigil, I sat down for a conversation with Rico Gutstein. Gutstein, a University of Illinois education professor, helped design and coordinate the writing of the proposal for the Walter Dyett High School for Global Leadership and Green Technology. Gutstein emphasized that the ideas came from a carefully conducted community process. Principle 1: The curriculum should be based in the culture, traditions, language of the local community. It should use that as starting point for a critical look at what is really going on there and asking profound questions about power and injustice. By addressing these questions in depth, students can begin to learn the academic disciplines necessary to advance their own lives and the community in which they live. Principle 2: There needs to be high quality teaching by teachers who are actually allowed to teach, not simply treated as disposable test monitors and collectors of misleading “data” from the deeply flawed corporate-created barrage of high-stakes testing. Principle 3: The students will have thorough wraparound supports with counselors, social workers and other professionals who can help address their social and emotional needs. But the Coalition wants to go beyond simply the therapeutic model. The Coalition envisions a series of internships, apprenticeships and colloquia that would help students find themselves by giving them actual responsibility as they learn practical skills for navigating human relationships and meeting the challenges of social justice. These experiences would begin in the 9th grade with a local community organization and change the 10th grade year to an organization dealing with citywide issues, then an organization that deals with national issues at the 11th grade and finally move to one that has a global focus as seniors. As students grow, mature and discover more about themselves, they also gain understanding of their complex relationship to a global society. Principle 4: One of the contradictions of U.S. public education is that while it is supposed to prepare students to live in a democratic society, the actual organization of most schools is based on a totalitarian model of control and management from above. [P]eer conferences, restorative conversations and circles create non-judgmental spaces for a student who broke a school rule, those affected, and members of the school community to discuss what happened, build accountability, and collaborate to find solutions that will repair the harm caused. This approach empowers students to be leaders in violence prevention, conflict resolution, and school safety. Principle 5: Although often derided as a liberal cliché, the phrase “It takes a village to raise a child” is taken literally in a sustainable community school. Gutstein emphasized how the experience, knowledge and wisdom of the adults in the school community and in the larger community is the foundation upon which one can build parent committees, the local school council and various advisory groups. Teachers can then learn from parents and people in the community about building the curriculum and shaping the goals of the school. All of this requires parent spaces within the building. WHY GREEN technology in Bronzeville? I asked Rico Gutstein this question directly because I know there are people who wonder about that. His answer was quite direct: “For one thing, it’s a food desert. That’s the starting point.” There are few general supermarkets in working-class communities of color, and when nutritious, organic food is available, it is too expensive for tight working-class budgets. Organic urban agriculture is at the heart of the Dyett green technology plan. The Windy City Harvest farm is right next to the Dyett Building, and along with three other urban farms is a partner in the Coalition. When Dyett High School was open, students worked in the Windy City farm through the school year, but mainly in the summer where they held a weekly farmers’ market. The Chicago Botanic Garden, a Coalition partner, would like to create a rooftop garden and also use the atrium spaces to grow food. The Coalition plans to integrate their urban farming concepts into an already existing CPS culinary arts program. Students could not only learn how to work in restaurants and food stores, but could prepare for careers in organic urban agriculture and green urban planning that works with the already existing food distribution infrastructure to transition into creating a new food infrastructure that works for working-class communities. In 2013, the United Nations issued a report saying that we must phase out the current system of industrialized agriculture with its reliance on fossil fuels, chemical fertilizers and pesticides if humanity wants to feed itself. The Dyett organic urban agriculture plan is right on time. In addition to the urban agriculture component, The Coalition would like the Dyett building to be certified as LEED platinum, the highest green building rating. This would be a multiyear process, which would involve the students in planning and creating the ecological systems necessary to achieve this. Energy conservation and renewable energy sources are critical for meeting today’s environmental challenges. Once again, the Dyett vision is right on time. It’s important to understand that the Coalition’s vision goes far beyond preparing students for the option of getting green jobs, as important as that is. There is also an all-encompassing philosophical or spiritual component that will go along with everything they plan to do–that the earth is our mother and human consciousness must be in harmony with that basic reality. WHY INDEED? Why on a planet undergoing terrifying climate change, and whose human population still suffers from the twin curses of poverty and violence, would the mayor and Board of Education oppose a school based on green technology and global leadership? The Coalition proposal speaks of young people entering the global stage as actors who have studied social and physical reality in depth, of young people learning academic and artistic disciplines on behalf of environmental sustainability as well as peace and justice. Does anyone seriously believe we can achieve environmental sustainability, peace and justice within the confines of our present, badly broken racist social system? Either in the community of Bronzeville or in the world at large? The system may be badly broken for most of us, but it works well enough for the corporate elite, which is who Mayor Emanuel and the Board of Education truly represent. The Dyett proposal speaks of young people using their education to become global leaders, transforming their world and bettering the planet. This is education for liberation and is implicitly revolutionary in its implications. What if other communities began to demand such an education, an education that challenges a corrupt and brutal system of oppression? What then? ← Event at Loyola Coming Up!